Fewer Americans are going to church these days, but a new national survey reveals that the most likely influence on who people vote for in this year’s presidential contest is their religious beliefs. The survey conducted by Barna asked a nationwide sample of voters to rate the relative personal impact of ten different sources of influence. Yet, the picture is not uniformly rosy for the religious world. While religious beliefs rank on top of the list of influences, pastors rank at the bottom. Opinion research has long shown that Americans resist admitting that their views or behavior are influenced by external sources, and particularly those that overtly seek such influence, such as advertising. The same pattern is common when asking people to estimate the perceived impact of certain influences on their political choices. Barna’s survey finds that none of the ten sources of influence are considered to have “a lot of influence” on who people will support for President by even as few as one out of every five respondents. The top-rated sources of influence are a person’s religious beliefs (18% say that had “a lot of influence”) and family members (10%). The other eight sources examined fall within the five to eight percent range. When combining those who say a source exerted either “a lot” or “some” influence upon their choice of a presidential candidate, the rankings change only slightly. The top influence is still religious beliefs, listed by one-third of adults (33%). That was followed by family members and news media, each listed by 28 percent, then friends and television political commentators, each chosen by one-quarter (26%). About one out of every five respondents say that each of four other sources had at least “some influence” on their choice: political commentators on websites and social media, political commentators on radio, political commentators in publications, and advertising by the candidates’ campaigns. The only laggard among the 10 sources is the pastor of the respondent’s church, listed as having at least some influence by just 14 percent of adults. However, when those people who do not have someone they consider to be their pastor were eliminated from consideration, then pastors were tied with the other four sources as the lowest-ranked influence, impacting one-fifth of adults (20%). When the Barna data were analyzed according to each person’s religious beliefs, very different patterns emerged. 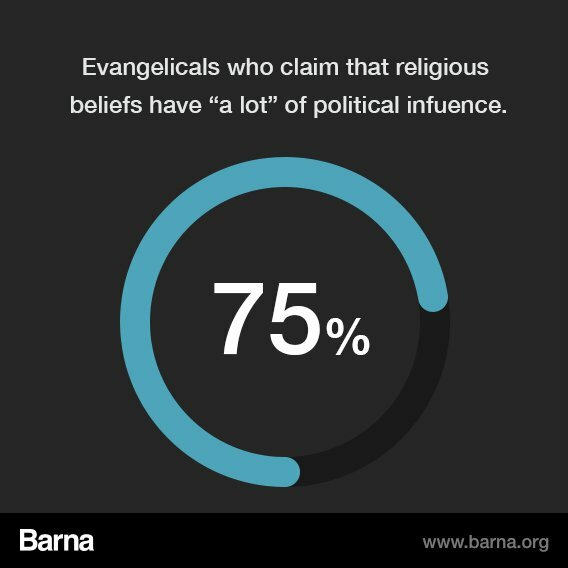 Three-quarters of all evangelicals (75%) assign “a lot of influence” to their religious beliefs. One out of five of them also attribute a lot of influence to the pastor of their church (22%) and to family members (21%). No other source tested is mentioned as having a lot of influence by even one out of ten evangelicals. The survey reveals that there are no evangelicals interviewed who say that either campaign advertising or political commentators in publications had “a lot of influence” on their voting choices. Like evangelicals, non-evangelical born again Christians also place religious beliefs at the top of the list of major influences on their voting choices. Altogether, three in 10 (30%) assigned “a lot of influence” to their religious beliefs. No other entity is listed by at least 10 percent of this group. Notional Christians – i.e., those adults who describe themselves as Christian but are not born again, a segment that represents nearly half of America’s churchgoing people – assign equal weight to the influence of six different information sources. About one out of every ten notional Christians assign either a lot or some influence to family members (12%), friends (11%), campaign advertising (11%), news media (10%), religious beliefs (10%), and their pastor (9%). Not far behind are political commentators on television and in publications (each at 7%) and political commentators on radio and on websites and social media (6% each). Statistically speaking there is no meaningful difference in the perceived influence of any of the ten sources evaluated. Adults who are not connected to Christianity have a different set of influences. People aligned with non-Christian faiths are most likely to say news media have a lot of influence on their political choices (18%). That’s followed by the impact of their religious beliefs (15%) and political analysts on television (12%). Religious skeptics – those who are atheists, agnostics, or have no religious affiliations – are the least likely of any faith group to admit to being influenced by external sources. Among the skeptics, family members, news media, and television analysts are the sources most likely to be acknowledged as having “a lot of influence” on their political choices. However, each of those are named by just 5 percent. A deeper dive into the data for all born again Christians – both evangelicals and the non-evangelical born again adults combined – reveals differences in influence according to age. Nearly half of those under 50 say their religious beliefs have “a lot” of influence on their political choices compared to just one-third of the born again adults 50 or older concurring. Looking more closely at the youngest segment, born again adults under 30 are more than two times as likely as older born agains to claim that each of five sources have “a lot of influence” on their political decisions. Those sources are friends, campaign advertising, and all manner of political commentators in the media. The research also indicates that born again men and women have slightly different influence patterns. Men were twice as likely to assert that they are influenced a lot by their pastor, by family members, and by the news media. Born again women, on the other hand, are considerably more likely than men to admit to be greatly influenced by their religious beliefs and by campaign advertising. While there are several minor differences between the influence patterns of Protestants and Catholics, one in particular stands out. Religious beliefs are listed as having “a lot of influence” by 36 percent of Protestants but by only 10 percent of Catholics. Political ideology also makes a substantial difference on what sources people acknowledge as having influence. For instance, religious beliefs are said to have “a lot of influence” on their political choices by more than one-third of conservatives (38%) but by less than one out of ten moderates (9%) and by barely one out of every twenty liberals (6%). The influence of pastors is more significant among conservatives (14%) than either moderates (3%) or liberals (4%). The Barna study also indicates that nine of the ten information sources have close to or more than half of adults who say that source had no influence on their political decisions whatsoever. The only source with at least half of the public admitting to being influenced by it, are the news media (with at least “a little” influence cited by 60%). Political commentators on television are said to have some degree of influence by half of the survey respondents. This research was conducted by the Barna Group using an online survey with a nationally representative sample of adults 18 and older. A total of 1,023 adults were interviewed, resulting in 908 registered voters and 627 likely voters participating in the survey. The surveys were completed online from September 12 through September 19, 2016. The estimated maximum sampling error for the aggregate sample is plus or minus 4 percentage points at the 95-percent confidence level. The sampling error estimate is higher for subgroups within the total sample.